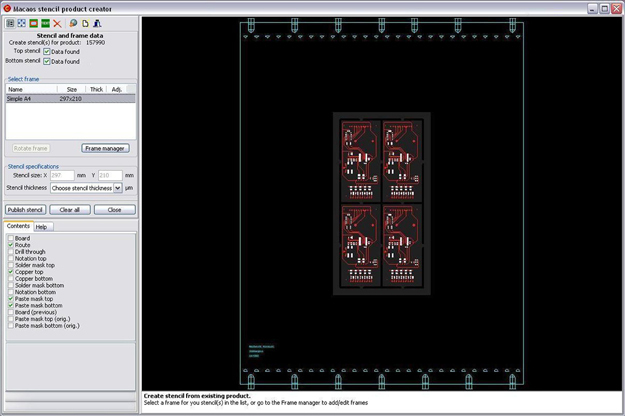 It is easy to create a solder paste stencil product, choose a PCB product in Macaos and click the Stencil button. Then you can select the stencil frame, size, data placement as well as any data modifications. Solder paste stencils are used to apply solder paste to the surface mount pads of a PCB. In general, the PCB are covered by the solder paste by stretching the stencil over the PCB and thus enabeling the paste to be correctly distributed over the PCB mount pads. The stencil openings as well as the stencil thickness affect the amount of solder paste.